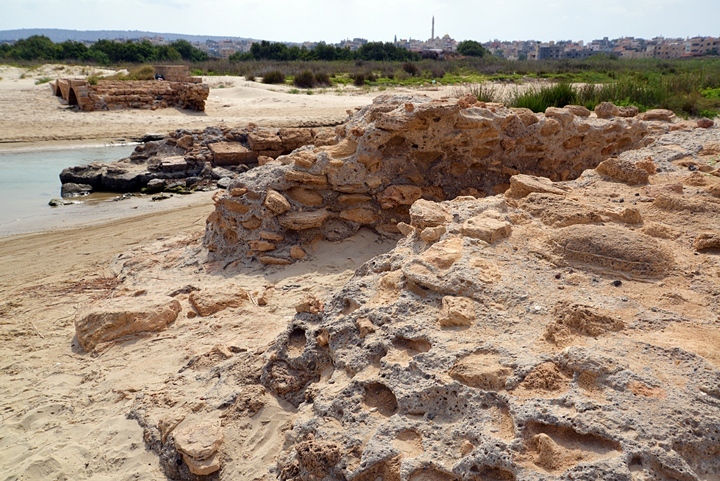 Tel Tanninim ("Crocodiles mound") is the ruins of the city of Crocodilopolis. 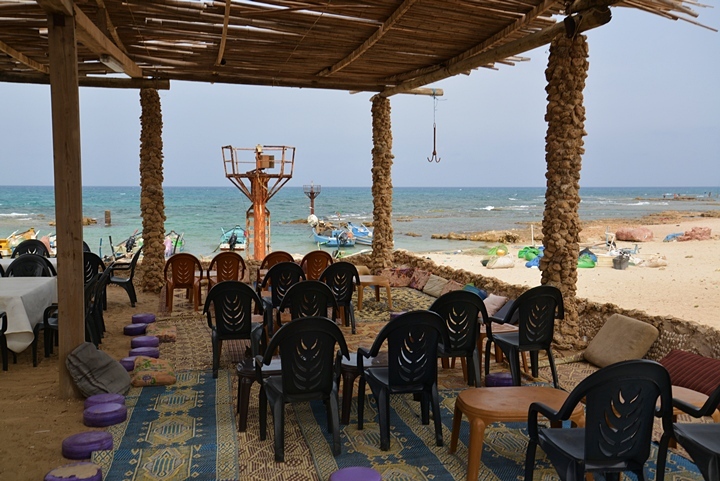 Jiser e-Zarka is located on the west side of the coastal highway, north of Caesarea. Access to the town is through an entrance road, which starts at the Beit Hannania junction on the parallel highway #4. 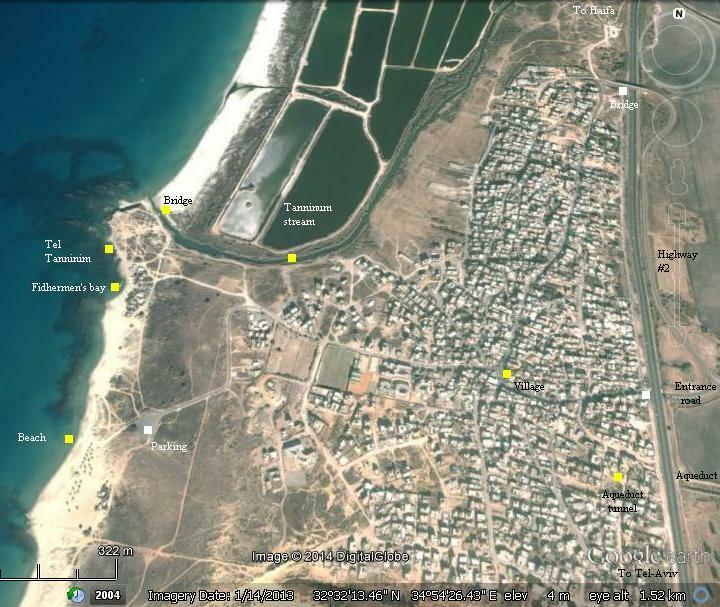 Tel Tanninim and the Fishermen's bay are located on the coast west of the town, accessed by a road crossing the town. An aerial view of the area, with an indication of the major points of interest, is shown here. You can click on a yellow square to navigate to the selected point in this or other web page. An ancient city was located on a small sandstone hill, south of the outlet of the Tanninim stream. 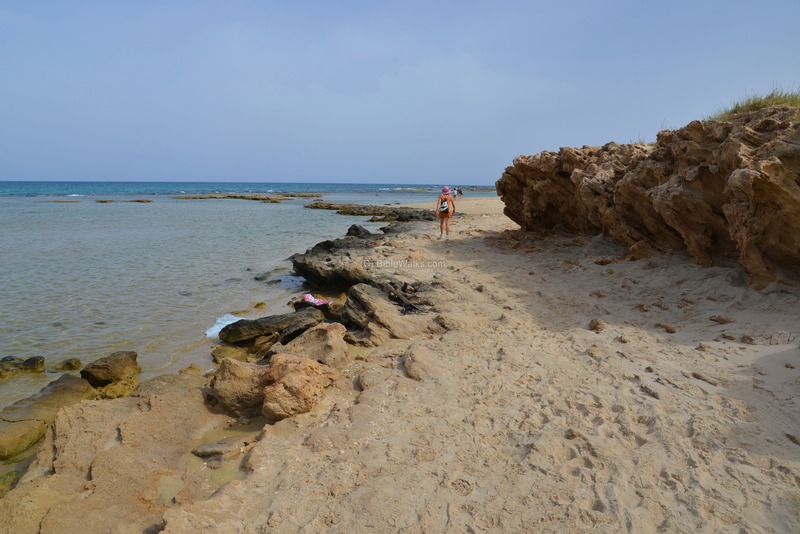 This was probably one of the Phoenician port cities, which used the natural anchorage places for their marine bases. 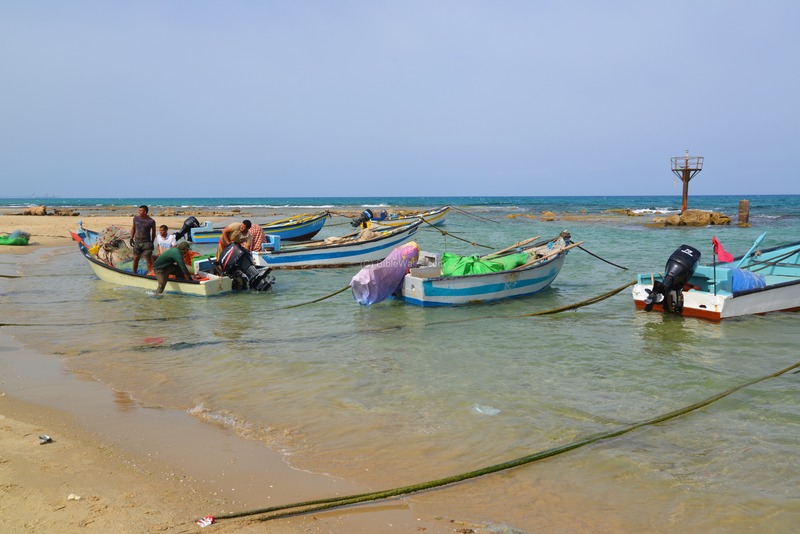 The port city was controlled by the Phoenicians of Tyre and Sidon, who provided maritime services to the Persians and later was part of the Seleucid kingdom. The ancient city was named after the crocodiles who were present in the river from early times. The city was called Crocodilopolis or Crocodilon polis ("city of the Crocodiles"). 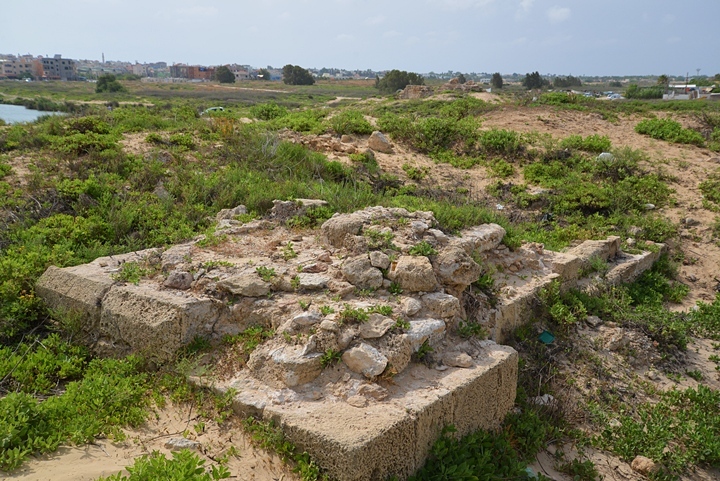 In the early first century, the site was abandoned, following the conquest of the coast cities by the Hasmonean king Alexander Jannaeus (103-102 B.C.). The city of Crocodilopolis continued during the Roman and Byzantine periods. 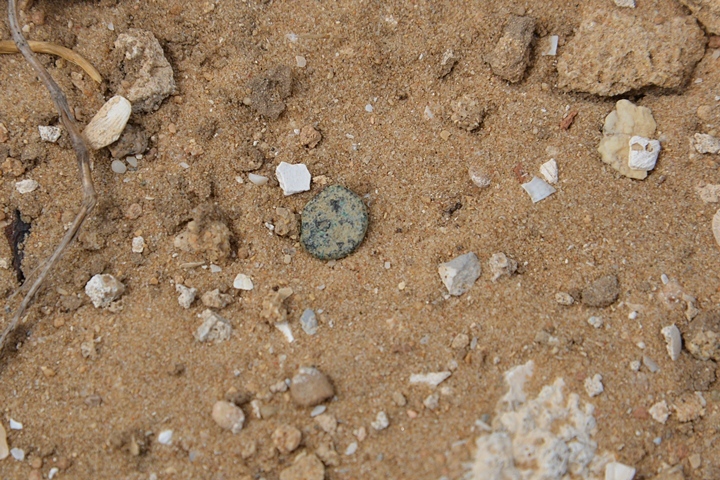 Remains of mosaic floors and coins can be found on the hill. Four kilometers (2.5 miles) to the south of Crocodilopolis was the great city of Caesarea Maritima ("by the Sea"). It was one of the most important cities in the Roman World, the Roman capital of the province of Judea at the time of Jesus, and a Crusader fortress along the road from Acre to Jerusalem. The city was first established by Herod (37BC to 4BC) and dedicated to the Roman Caesar, Augustus. As part of this great project, an aqueduct was built as a solution for the water supply of this great city. The first aqueduct was built by Herod at the time the new city was founded It brought the water from the southern side of Mount Carmel, at Shummi, about 10KM to the north east of the city. The water flowed on a single raised canal, and in one section it is dug into the rock (here, in Jiser-e-zarka). Since even this was not sufficient, a second "lower" aqueduct was built by the Legions of the Emperor Hadrian (2nd C AD). It brought water from Tanninim (Crocodiles) river, farther from Shummi. This section, with a tunnel of about 6KM long, was tapped into the older aqueduct, and doubled its capacity. This new source of water was added to the right of the first canal, and the aqueduct was thus doubled in width. The builders used the same building materials and style, so it is hard to see that the pair of tunnels were built in different ages. The aqueduct continued to supply water for 1200 years, until the Crusaders period. During the ages it was repaired several times. 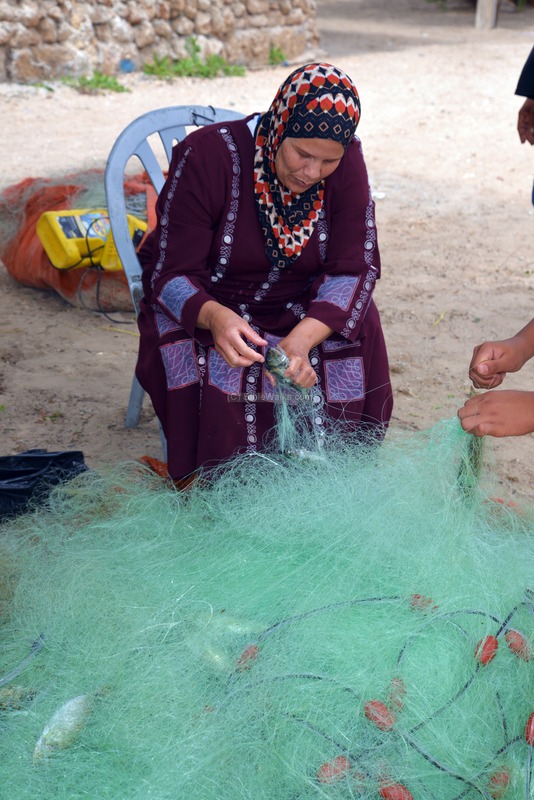 In the marsh lands east of Jiser e-Zarka a bypass canal was built to overcome the damages. During the Byzantine period, a large basilica Church was constructed on top of the mound. 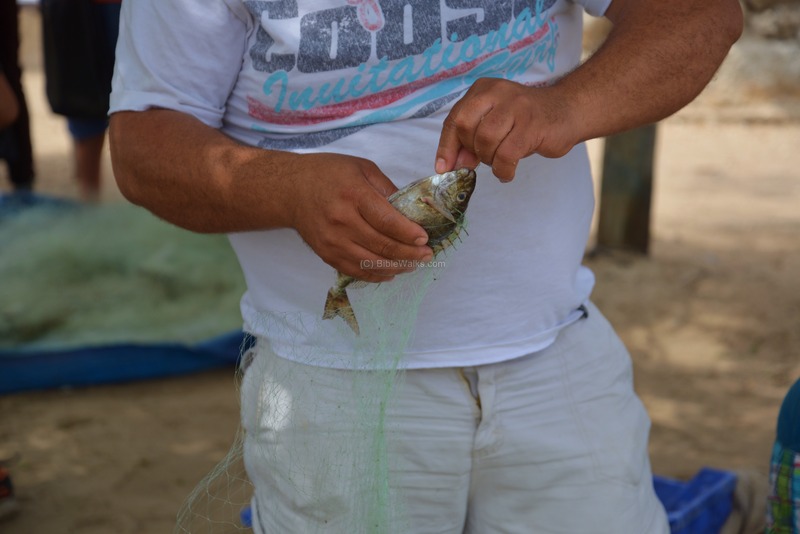 Fish farming was one of the main sources of income - several fresh water fish ponds were constructed, with water tapped off from the high-level aqueduct by a secondary aqueduct. 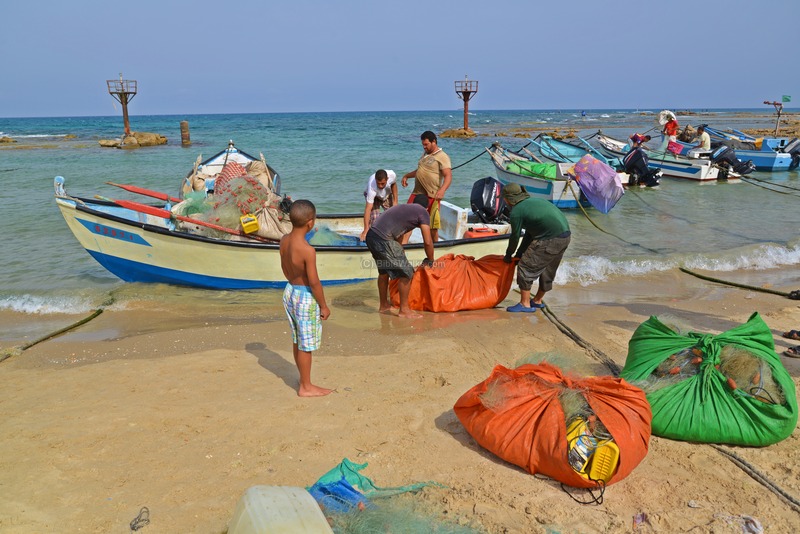 The fish were then sold in Caesarea. 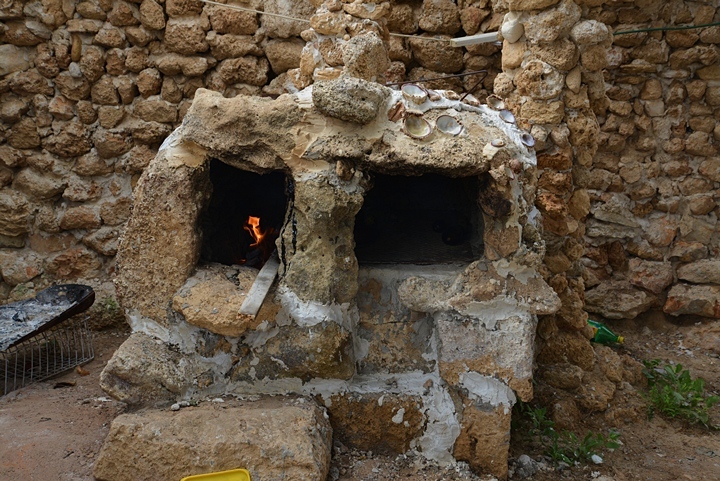 The place was now called in Aramaic Migdal Malcha - "Saltworks tower" - which is referenced in the Jerusalem Talmud (the 5th C A.D. books of Jewish religious practices). 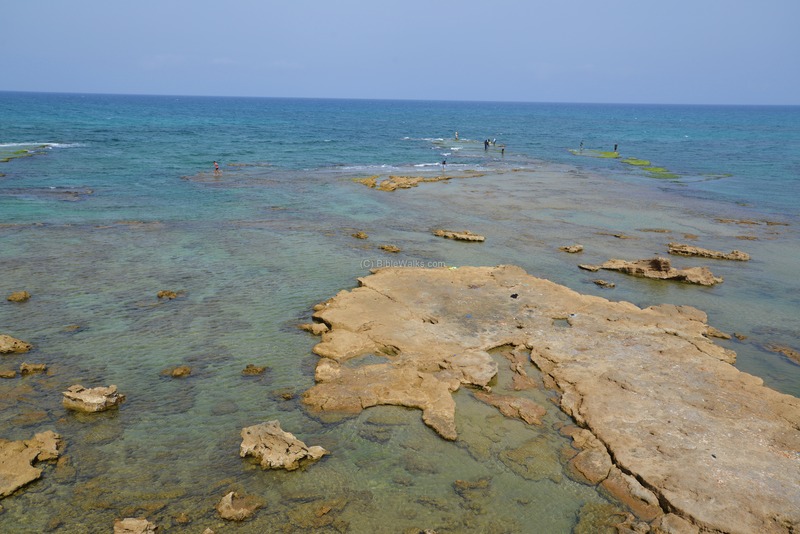 It was probably an urban extension of the large neighboring city of Caesarea. The village continued during the Umayyad period (640-740) but was destroyed during the Late Islamic period (750-1099). On top of the hill of Crocodilopolis are remains of the Crusader period tower. This was a fort which was built to protect the coastal road, guarding the pass through the bridge over the stream. A small naval base was established here. 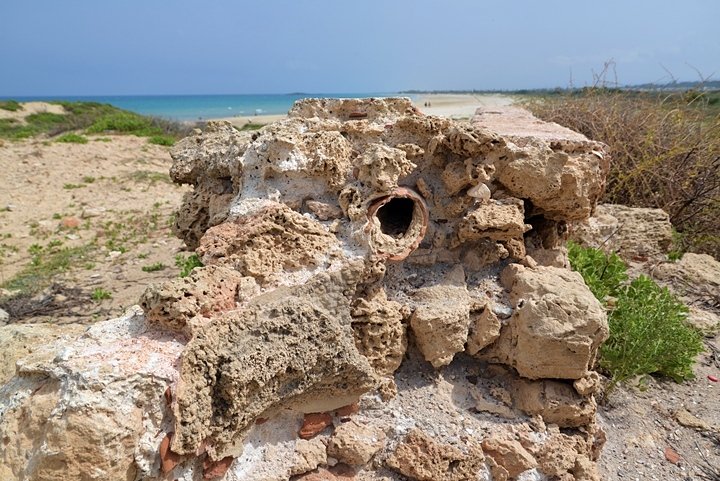 The name of the fort was Turris Salinarum ("tower of salt works"), named after the local salt production in the salt pans in the mouth of the stream. Its name may have also be based on the coastal road, where the salt was transported from other salt works along the coast. The tower was granted to the Crusaders order of Hospitallers between 1154 and 1168, but was officially sold to them and confirmed in 1182. 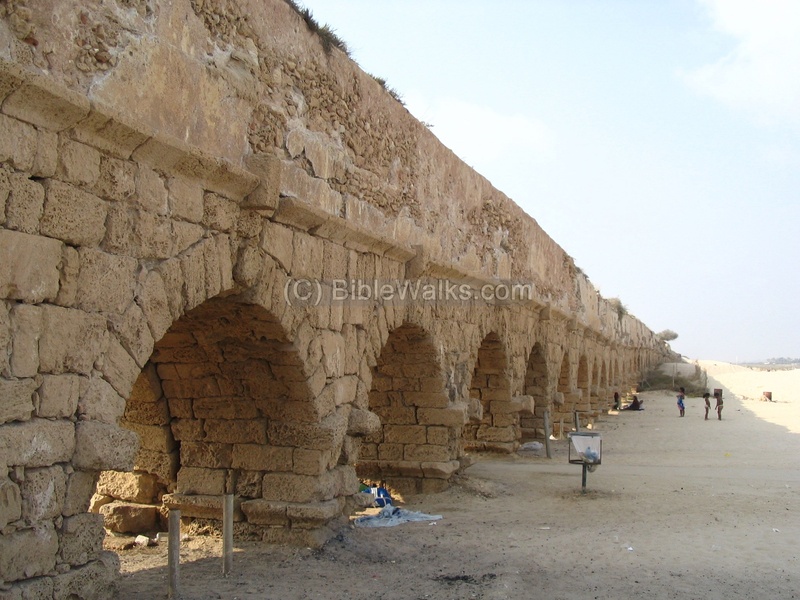 After 1200 years of operation, the Herodian and Hadrian aqueducts (first two aqueducts) were beyond repair. Therefore, in the Crusaders period (12th C A.D.), a third, smaller, canal was built that replaced the first two. At that time the City was smaller and required less water, so the third smaller canal was sufficient. Another (forth) lower aqueduct was built during the Byzantine period in order to satisfy the growing needs for fresh water supply to the large city. This aqueduct started from a new source of water: the springs at Maagan Michael, several kilometers north to Jiser-E-Zarka. Since the water level was too low, a dam was built in order to create a lake, thus raising the water levels at the source. Then, a canal was dug in the sandstone ridge and brought the water to the city. This canal was laid lower and to the east of the raised Aqueduct. 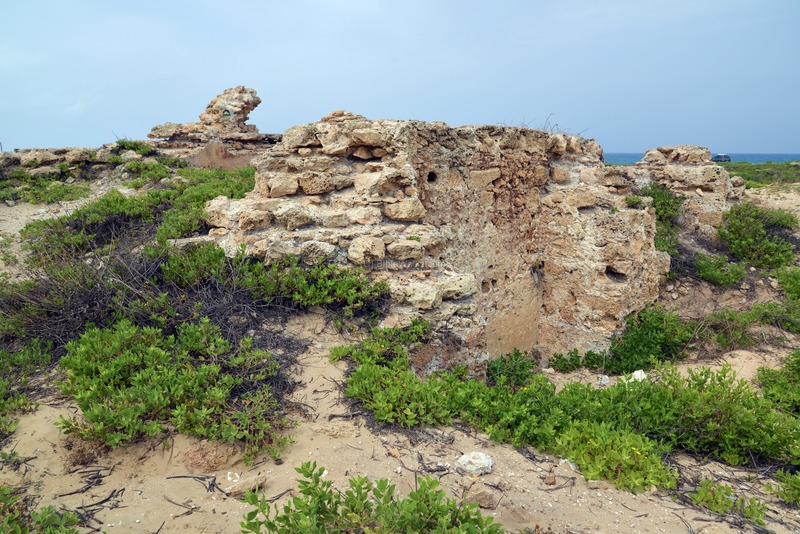 After the fall of the Crusader Kingdom, all coastal Crusader fortifications, including here, were leveled by the Mamlukes (1263-1265), who feared the return of the Crusaders. This was the last occupation level at Tel Tanninim. The area of was examined in the Palestine Exploration Foundation (PEF) survey (1866-1877) by Wilson, Conder and Kitchener. During that time, the town did not exist, so it is not shown on their map. 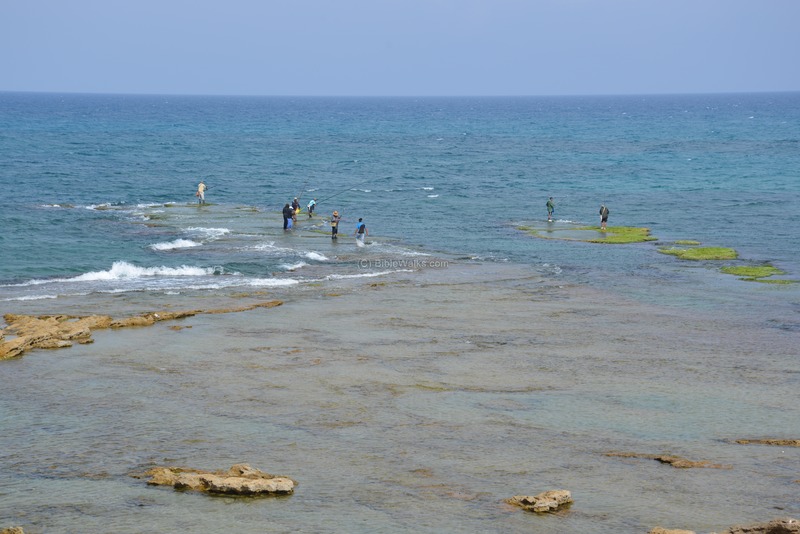 "Nahr ez Zerka is one of the most important streams in Palestine. It is fed by fine springs near Ma-mas (Sheet VIII), and is dammed across at the Jisr ez Zerka, where it has formed a broad, deep pool. Extensive marshes, entirely impassable, exist along the course of the stream on either bank. The water is clear and good. 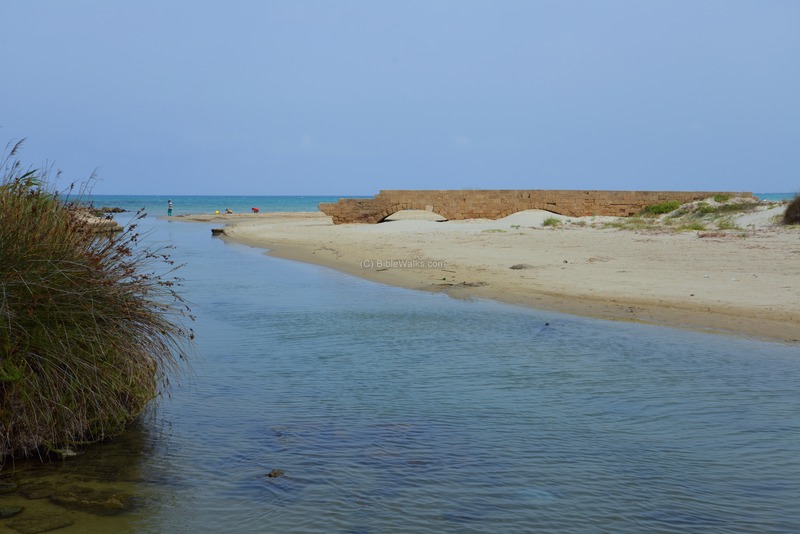 The stream flows into the sea near el Helat over a stony bed, and was found to have a strong current 5 to 10 yards across, and about 2 feet deep, in October, 1876". 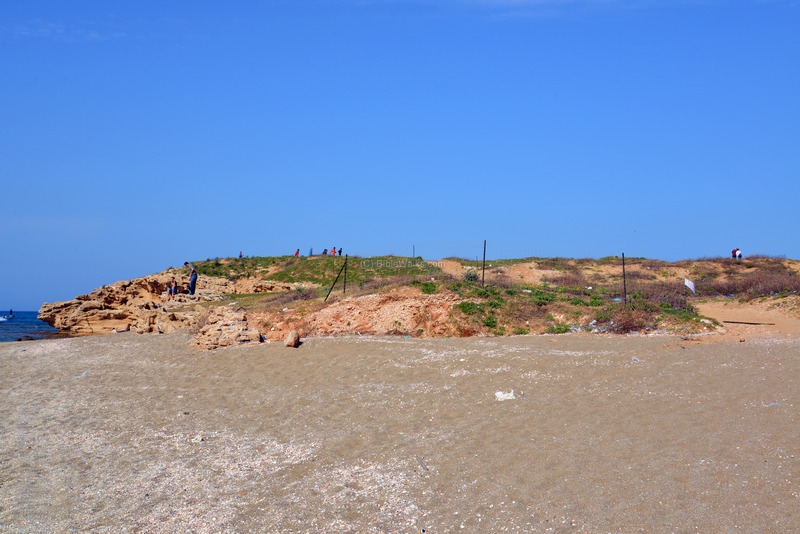 El Helat - There are remains here of a small tower on the shore, and of foundations and cisterns built of rubble. Only the rubble remains in the tower, with hard white mortar, possibly once faced with ashlars. There are remains of the piers of a bridge, just north of the present mouth of the Zerka. The work has every appearance of Crusading origin". Several aqueducts pass at this area, which are marked on the map on the right. 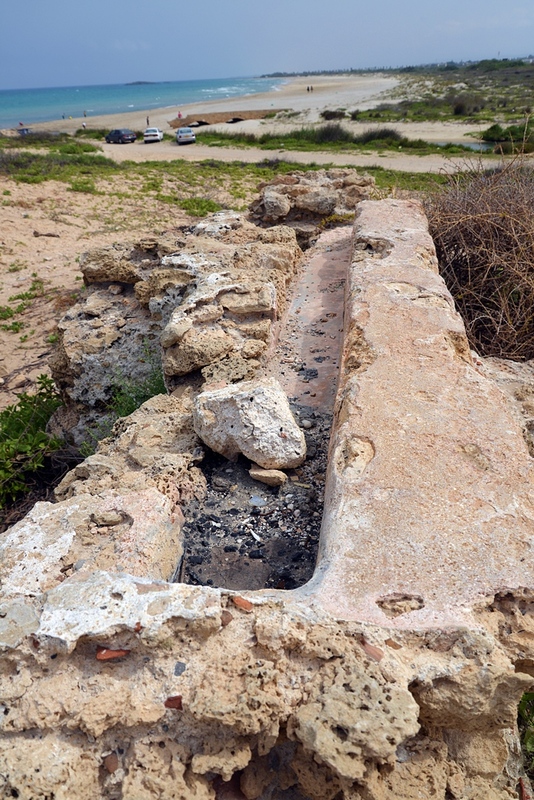 These were the main water supply for the great Roman city of Caesarea. The High level aqueducts (the first and second) were built during the Herod and Hadrian and brought water from the east, while the lower level aqueducts (third and forth) were built during the Crusaders period and brought water from the north. The PEF survey mistakenly linked the aqueduct to Tel Tanninim (el Helat or Melat) to the lower aqueduct, as shown in this map. However, a modern survey (Yossi Porat, 2009) found that that section was actually fed from the high level aqueduct (to the south of the Tel), and was built during the Byzantine period. Systematic excavations took part in Tel Tanninim is 1996-1999, headed by Robert R. Stieglitz. The site was damaged due to looting in the 1990s, and following the heavy storm of December 2010. Tel Tanninim is located on the Israel national hiking trail's route. 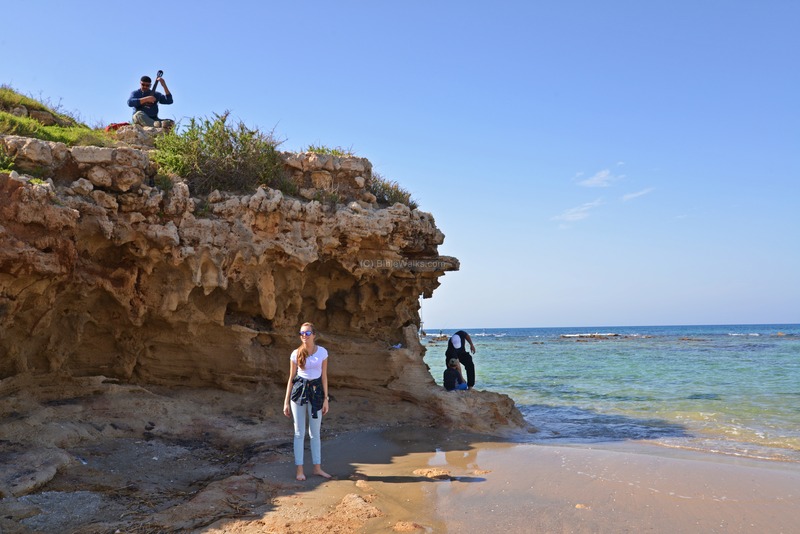 On the coast west of Jiser e-Zarka is a small hill, with ruins of an ancient city dated to the Hellenistic, Roman and Crusaders periods. It covers an area of 180 x 125m (2.25 Hectares) and its north-west peak is 10m above the sea level. 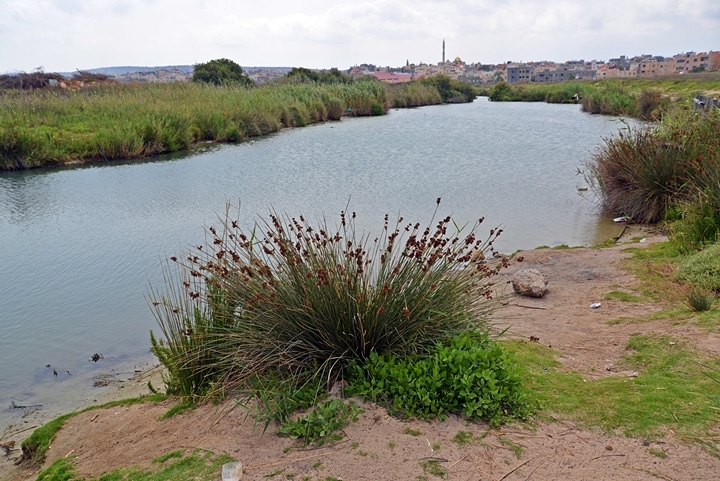 The modern name of the site, Tel Tanninim ("mound of the crocodiles"), is based on the name of the river that crosses its northern side. This aerial view was captured from a quadcopter. The ruins are located on a hill on the south bank of the Tanninim stream. The ancient city was also named after the crocodiles who were present in the river from early times. The city was called Crocodilopolis or Crocodilon polis ("city of the Crocodiles"). Note that in Egypt, southwest of Memphis, is a city with this name, where the people worshiped a crocodile-god. The following photo shows the site from the south side. The next photo is a view from the top of the mound towards the east. Behind the Tanninim stream are the houses of the town of Jiser e-Zarka, which is 500m away. 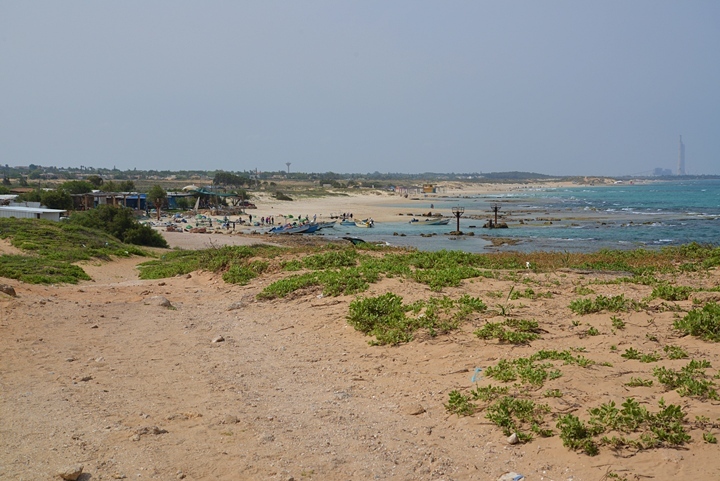 Another view, towards the south, shows the fishermen's pier and village, and beyond it the public beach. In the far background is Caesarea, and beyond it are the tall chimneys of the electrical company. To the west is the sea, which seems like a favorite fishing site. The Google aerial view reveals three possible locations of anchorage places of the ancient city of Crocodilopolis - #1 & #2 on the north of the mound, and #3 on the south (the present location of the fishermen's pier). The hill is covered by sand, with few visible remains on it. 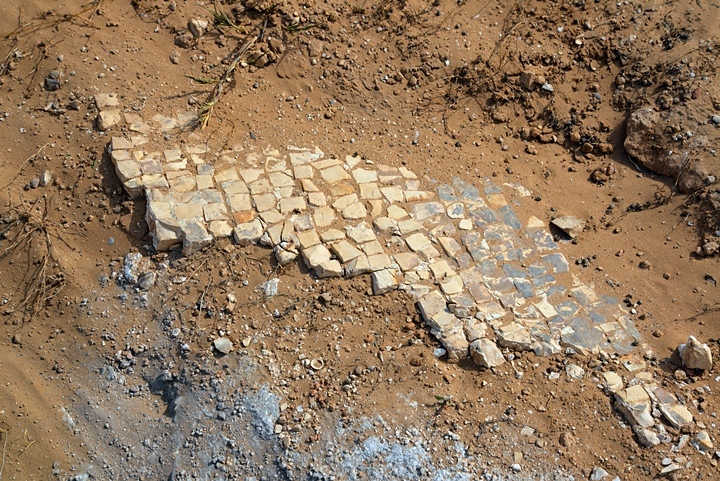 Some sections of multi-colored mosaic floors can be found, perhaps belonging to the large Early Byzantine (late 4th Century to early 5th Century) church. Mosaic floors were also used here during the Byzantine period for breeding ponds, used for growing fish. 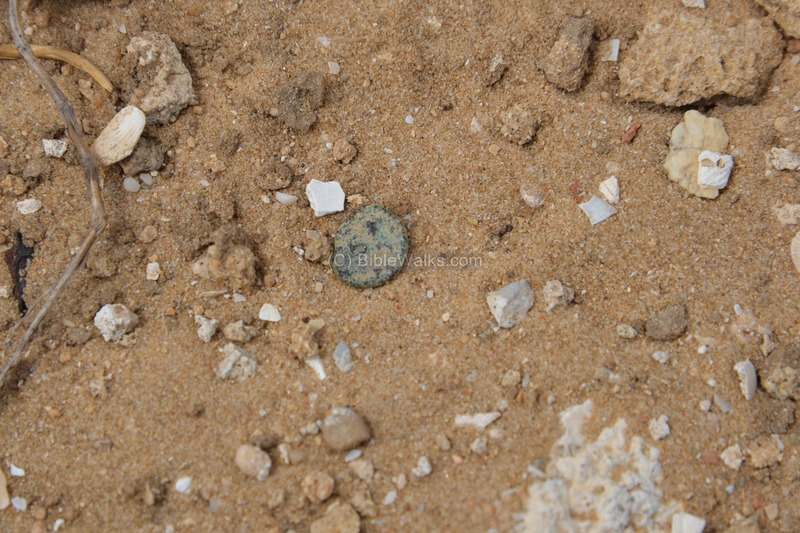 Several coins were visible on top of the hill, like this one - probably a small Roman/Byzantine coin. 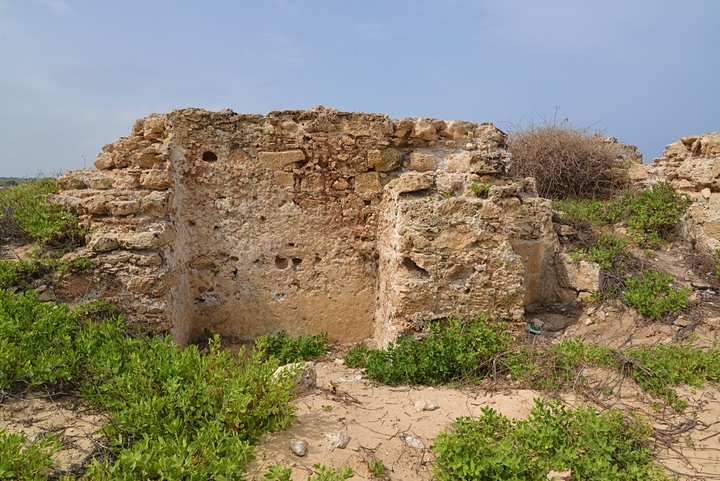 The PEF report describes the few remains on top of the hill, such as this Crusader period house (VII, p. 33): " There are remains here of a small tower on the shore, and of foundations and cisterns built of rubble. Only the rubble remains in the tower, with hard white mortar, possibly once faced with ashlar". On top of the hill are remains of the Crusader period tower. This was a fort which was built to protect the coastal road, guarding the pass through the bridge over the stream. 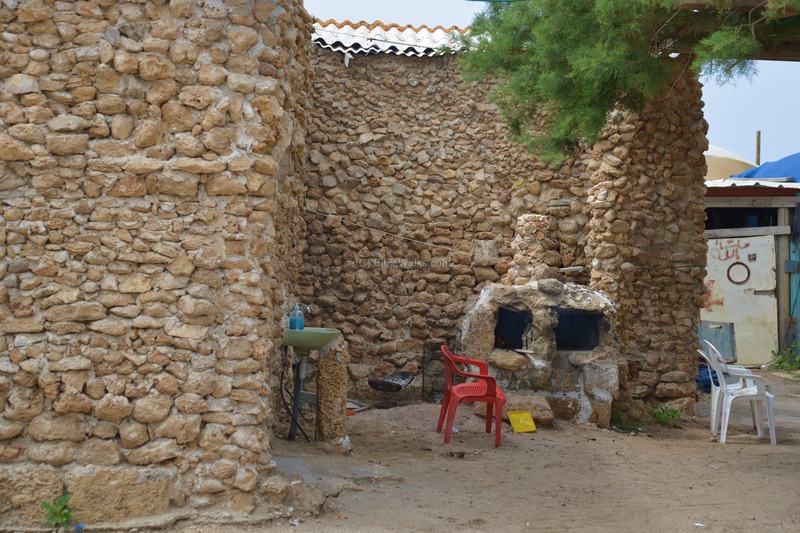 The name of the settlement was Turris Salinarum ("tower of salt works", or Migdal-Malcha in Hebrew), named after the local salt production or after the road that carried the salt which was harvested along the coast. The fort belonged to the Hospitallers order. Remains of an aqueduct are seen in several locations on the hill. This aqueduct, 1300m (4265 ft) long, brought water to Tel Tanninim, and was dated to the Byzantine period. Its course was from the southeast, then along the south bank of the Tanninim stream. The aqueduct tapped off the main line of the higher-level aqueduct to Caesarea, which is located to the south east of Tel Tanninim. 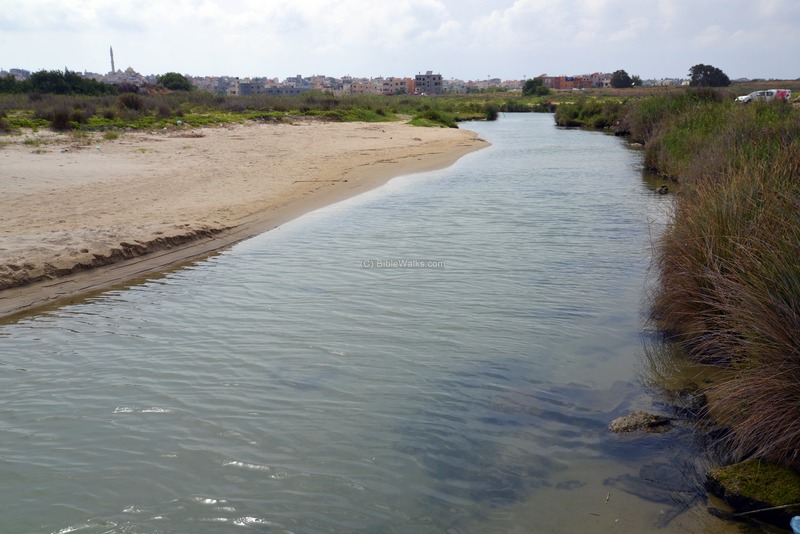 It did not tap off the lower aqueduct, as the PEF surveyors assumed, since the water level here is 6.3m above sea level, while the lower aqueduct is lower (6.25m), and the high level aqueduct is 8.2m above sea level (see Yossi Porat's article). In several excavations the archaeologists discovered sections of the missing link between the high-level aqueduct and Tel Tanninim (labeled aqueduct 'E'), including the installation where the split occurred - 70m west of the outlet from the sandstone ridge. The aqueduct ended in a reservoir pool on the foothills of Tel Tanninim. Its size, according to the excavator Stieglitz (1998), was 13.6m by 5.44m, and its height was estimated at 2.72m - a total of 200 M3. An installation on the south west side of the pool delivered the waters to different users, including a bathhouse, a monastery, and possibly to fresh water fish ponds (piscinae), which were in use during the late Byzantine period. A clay pipe is seen on the edge of the aqueduct. 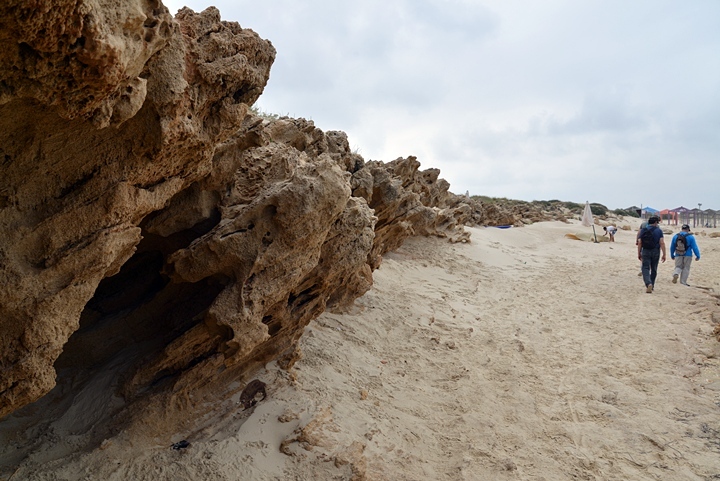 In its inner side are remains of the deposits that accumulated over the years. The Crocodiles (Tanninim) stream loops around the village on its north and west sides. It is named after the crocodiles that lived in the stream until the 20th Century. The Greek name of the stream is Krokodeilon, named after the Crocodiles. This aerial view, captured from a quadcopter looking towards the east, shows the stream and Jiser e-Zarka in the background. The stream is also called e-Zarka, or Wadi Zerqa, which is in Arabic: "the blue". This permanent stream flows year round (this picture was captured in June). Its source is in the Menashe hills, east of Mt Carmel, and it feeds from springs along the path of the valley of Tanninim. "Nahr ez Zerka is one of the most important streams in Palestine. It is fed by fine springs near Ma-mas (Sheet VIII), and is dammed across at the Jisr ez Zerka, where it has formed a broad, deep pool. Extensive marshes, entirely impassable, exist along the course of the stream on either bank. The water is clear and good. The stream flows into the sea near el Melat over a stony bed, and was found to have a strong current 5 to 10 yards across, and about 2 feet deep, in October, 1876. 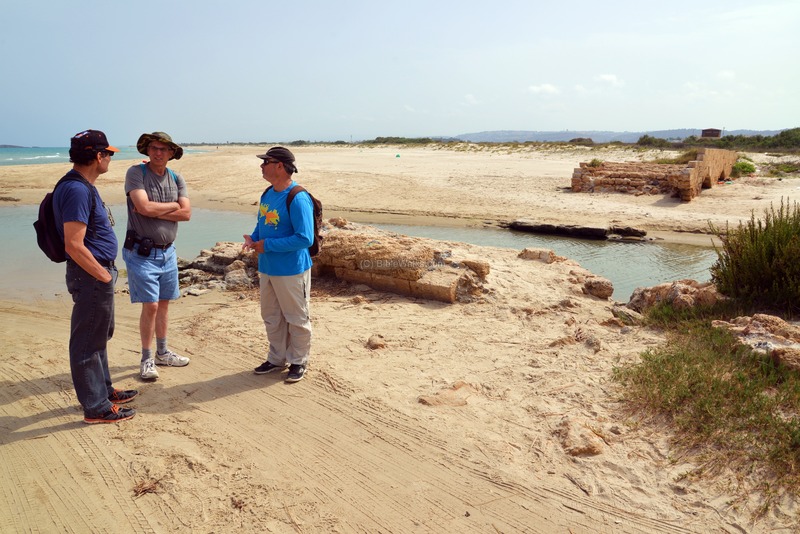 The ruins of the bridge at this point show the course to have altered slightly southwards since Crusading times. The course of the stream is hidden above the dam by a cane-brake and rushes. 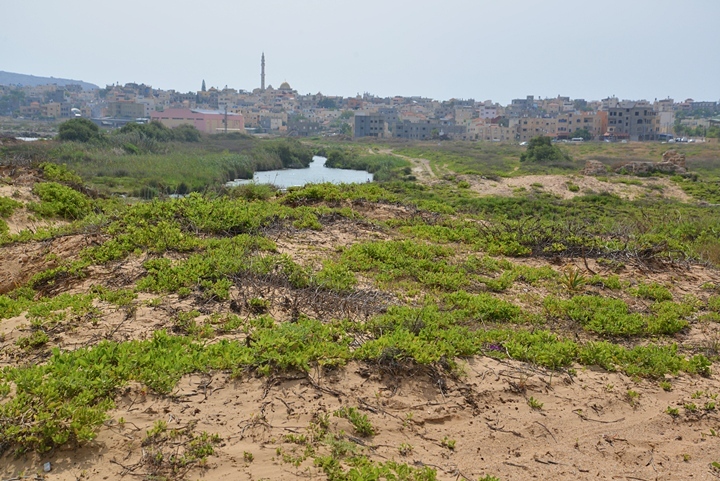 The tamarisk grows luxuriantly in the marshes, and the Syrian papyrus was found in the stream, being the only place near the coast where it was observed except in the Nahr el Falik (Sheet X.). The Zerka is the ancient Crocodile river (Reland, Pal, p. 730), and was so known also to the Crusaders (I tin. Ric, book iv.). The crocodile is still found here according to Abu Nur, the owner of the mill on the river. Close to this mill a low foot-bridge spans the stream. This, with the viaduct over Jisr ez Zerka, is the only place where the stream can be crossed, except at the mouth, where it is generally fordable". 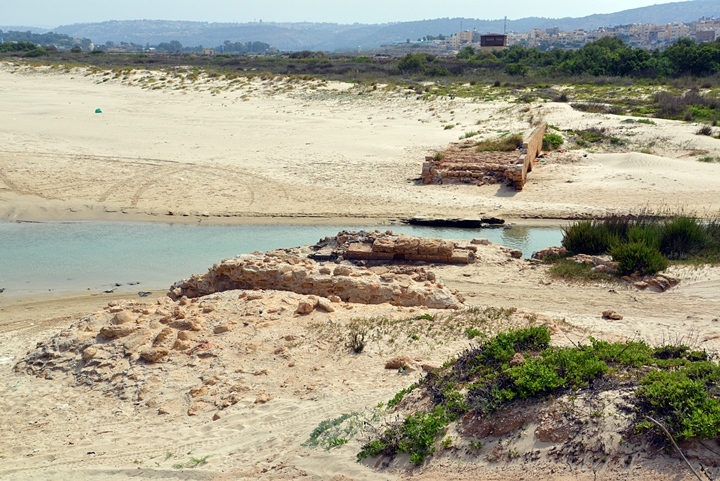 Ruins of an Ottoman period bridge are located north of Tel Tanninim, near the outlet of the stream. The next photos is a closer view of the bridge, from the top of Tel Tanninim, towards north-east. The bridge was constructed during the historic visit of the Kaiser Wilhelm II - the last emperor of Germany and King of Prussia - and his wife Augusta Victoria, who sailed to Haifa and rode on a carriage to Jaffa and Jerusalem (1898). The PEF survey of 1873 describes piers of a bridge piers of a bridge (VII, p 33): "There are remains of the piers of a bridge, just north of the present mouth of the Zerka. The work has every appearance of Crusading origin". Therefore, the bridge of 1898 was built on top of the earlier viaduct, probably of the Byzantine period. The coastal road passed close to the sea, since the eastern side of the Jiser e-Zarka hill was at that time a marshland, while this section was solid sandstone and easier to support the road. 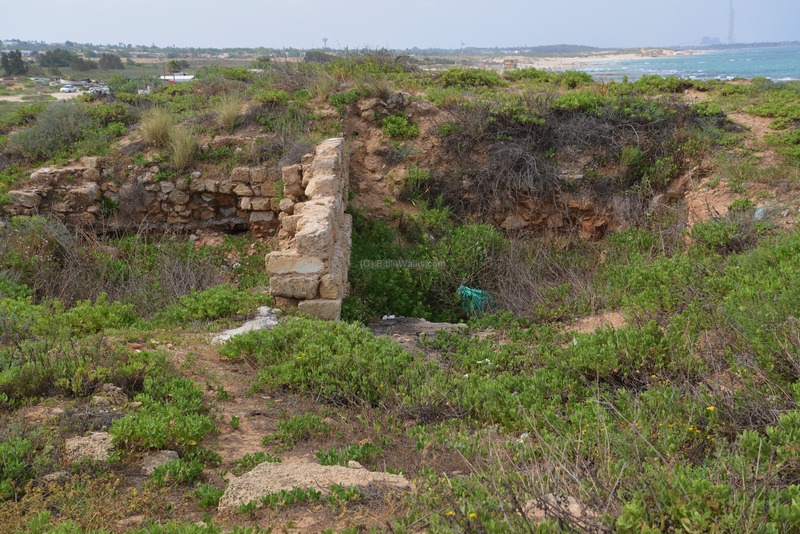 The northwest corner of Tel Tanninim is adjacent to the mouth of the stream. These twin dogs also enjoyed to jump in and out of the stream. The breeds of these dogs is Vizsla, a Hungarian sporting dogs who are energetic and loyal companions. 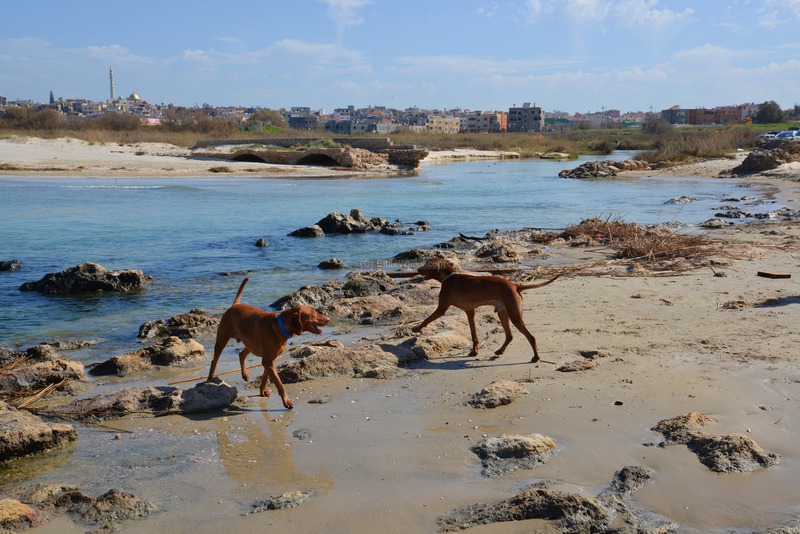 As Vizsla dogs are excellent swimmers, they enjoyed the waters. 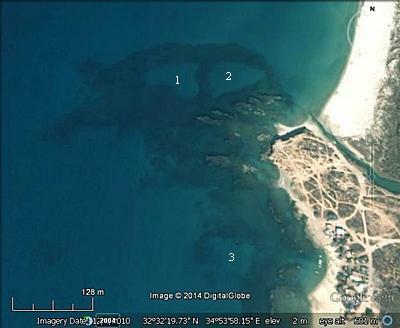 What appears as an ancient rock-slip is located on the shore, seen here in the center. 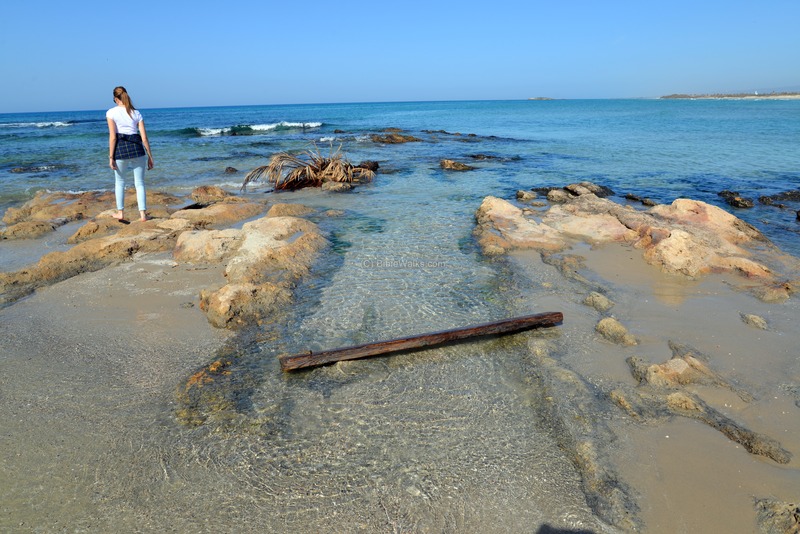 This may have served as a dry dock, which served fishing vessels and/or military ships. 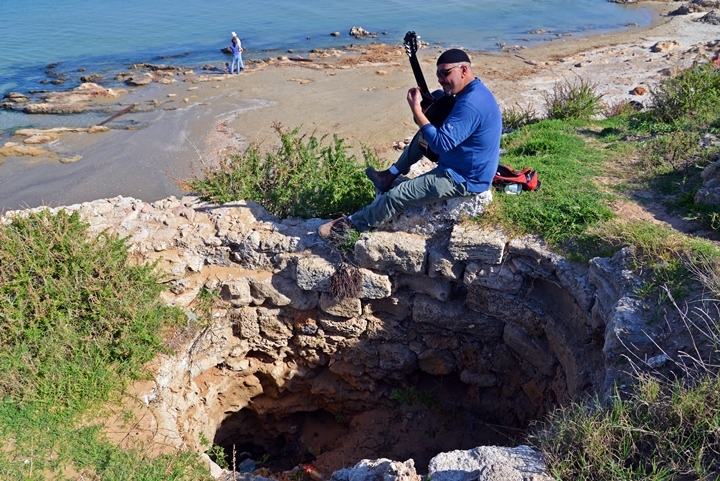 The sea has a magical effect on the soul... On the northwest corner of Tel Tanninim we met Amash Amad who sat on the edge of the cliff and played the flute and guitar for his own pleasure. Amad lives on the north side of Jiser e-Zarka, is 42 years old, and plays music since age 10. He dreams that one day someone will upgrade this place, with all its great potentials, to a leading tourist site. You can listen to his music and the soothing sound of the waves. 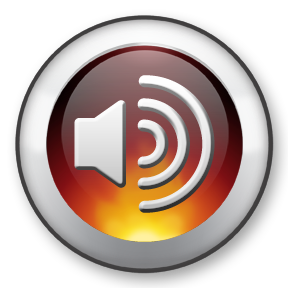 Click here to run the recording. 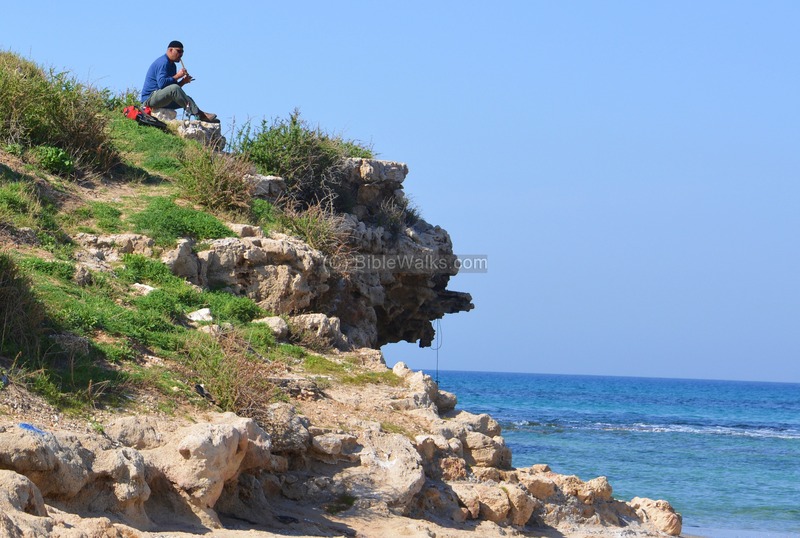 On the very edge of the cliff, where Amad was playing his guitar, are remains of an ancient structure, perhaps part of a tower(?). 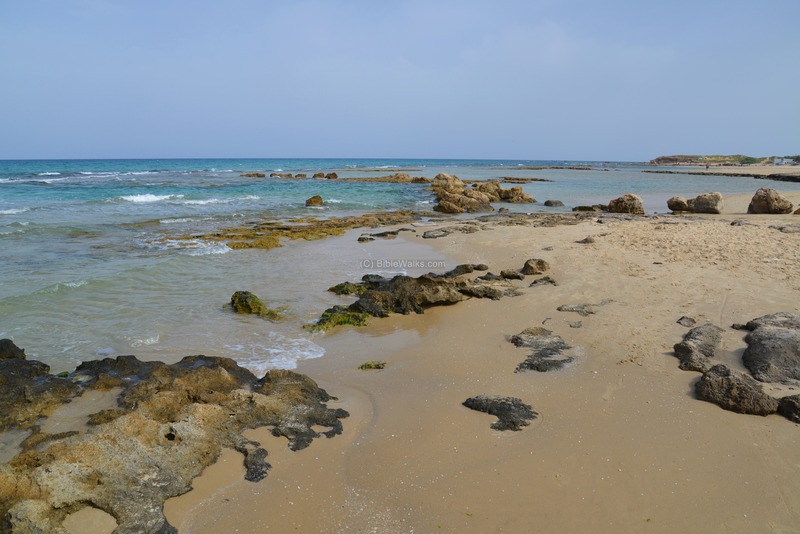 A public beach is located to the south of Tel Tanninim, west of the town of Jiser e-Zarka. 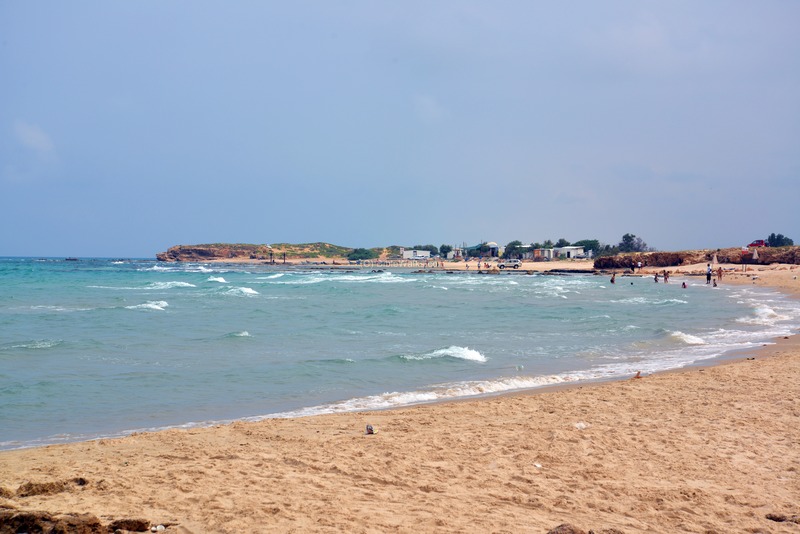 You can park the car in the parking lot, and enjoy the sandy beach or stroll along the shore. There are several good spots along the beach. The sandy bay on the north is seen in the next photo. In the background is the fishermen's pier and village, and behind it is Tel Tanninim. In a small sandy bay, just south of Tel Tanninim, is an anchorage place for the fishermen's boats. In ancient times, this pier may have served as a harbor. 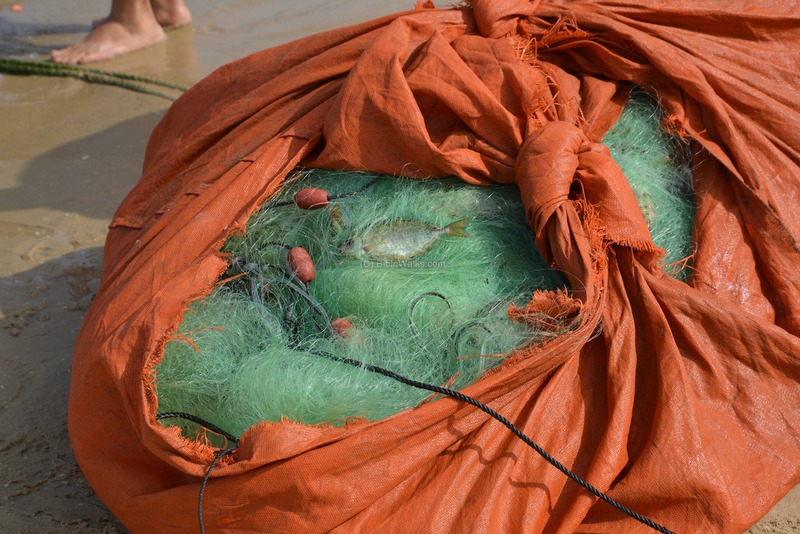 One of the fishing boats returned to the pier, carrying a load of packaged nets. 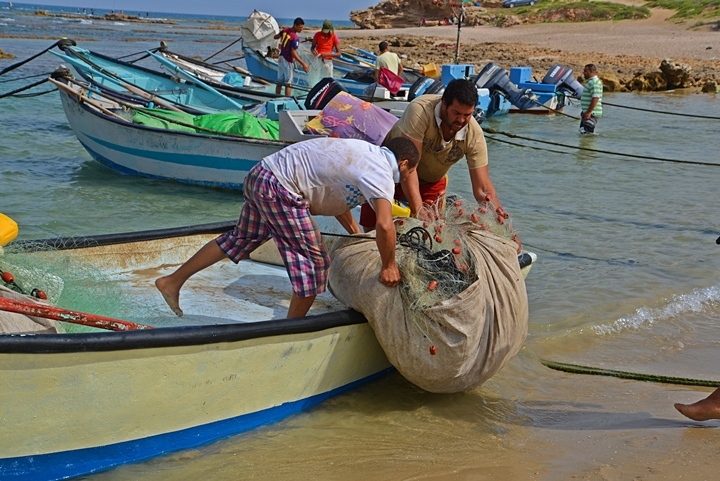 The net packages are off loaded from the boat, and carried into the fishermen's restaurant. A peek into one of the net packages shows one of the fish caught in the net. The packages are opened, and the fish are then manually pricked out of the nets. 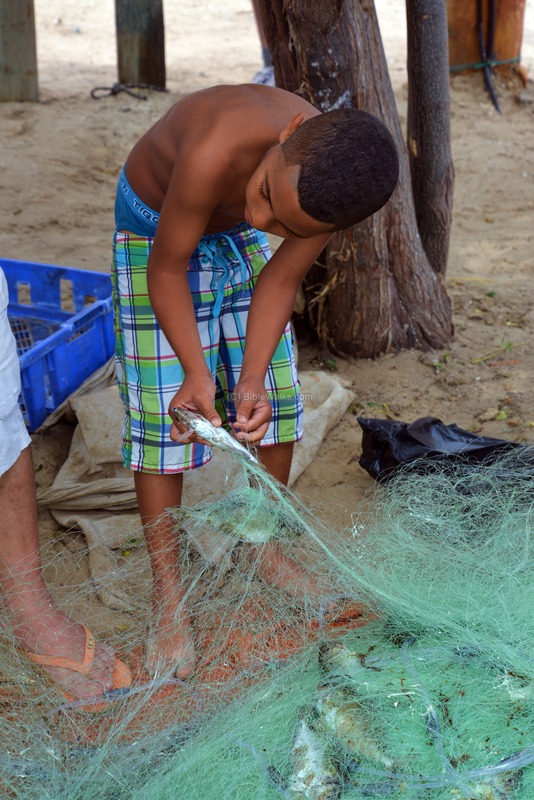 After the fish are extracted from the nets, they are carried out to the market to sell their catch, or fried and served fresh in the adjacent fish restaurant. Behind the pier is a fish restaurant, where the catch is fried and served fresh. The visitors enjoy the great view of the beach and the fishing activities. 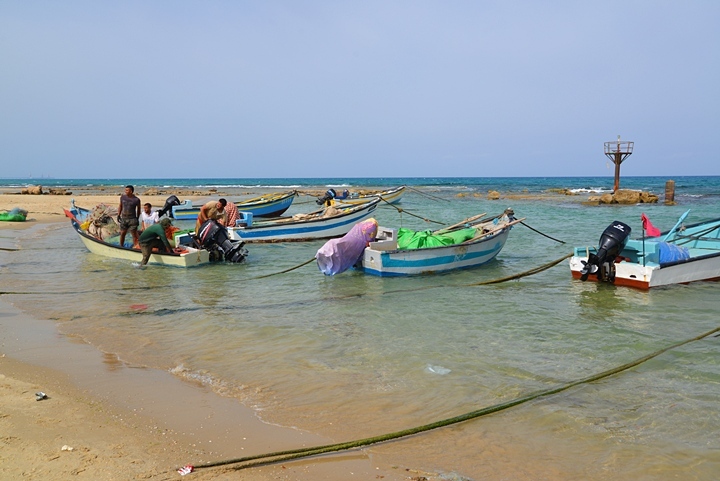 The restrooms, viewed in the next photo, are in the back of the fishermen "village". Their particular style catches the eye. 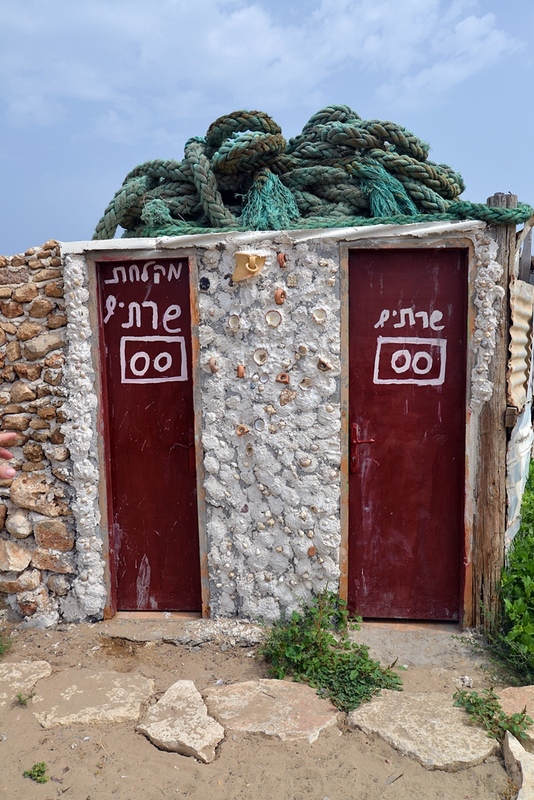 The Hebrew signs on the doors are misspelled - "servers shower" and "servers", but the "00" provides a better explanation for their purpose. From "Archaeology and the Bible" by George Barton (1816, p. 253): "In Job 41 there is a long description of the crocodile under the name leviathan [BW: whale]. In verses 19-21 some things are said of him that do not suit a real crocodile, and some scholars have thought that the language was influenced by the Babylonian material. These verses are: "Out of his mouth go burning torches, And sparks of fire leap forth. Out of his nostrils a smoke goeth. As of a boiling pot and burning rushes. His breath kindleth coals, And a flame goeth forth from his mouth". ". Similar references to the "monster" are in Psalm 89:10 and Isaiah 51:9.